Are the Atomic Floyd PowerJax + Remote in-ear headphones a sound investment? The Atomic Floyd Powerjax+ Remote earphones are built but have they got what it takes to impress us in the sound department? It's becoming increasingly more difficult to stand out of the headphone crowd these days however British audio expert Atomic Floyd has had more success than others in recent years most notably with its sleek looking, bassy sounding SuperDarts in-ear headphones. Aiming to deliver the same all round performance but with a significantly cheaper price tag, the Atomic Floyd PowerJax + Remote in-ear headphones are the company's latest offering hoping to tempt the money out of your pocket. 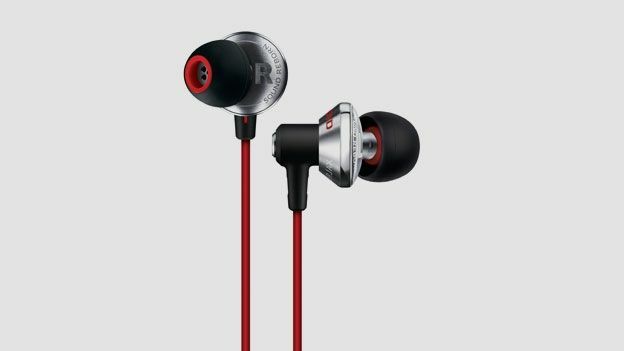 The Powerjax cans certainly deliver in the design department, from the steel earbuds that extends through to the inline remote and the red Kevlar cable. The soft silicone ear tips come in three sizes (small, medium and large), while the three button inline remote will let you control volume, pause, play, and change tracks which Is a slightly more fiddly feature to use. There's also a built-in microphone on board to take care of hands-free calls. Despite the weighty feel of the chambers, the angled fit design means the Powerjax earphones rest inside the ear as opposed to having to squeeze them more intimately inside the ear like some in-ear headphones. Having even taken them out for a run, they also remained secure in the ears and required little to no fiddling to re-position them. As we've seen with previous Atomic Floyd offerings, these will go the distance and can take a through beating at the bottom of your bag and come out unscathed. The Kevlar cable lives up to its tangle-free billing while the 3.5mm jack plug is crafted from gold plated steel and adds to its tough exterior. The silicone tips also stay fimly locked inside the tough marine grade stainless steel chambers. The packaging claims 'raw undistorted power' which means you can expect an a large emphasis on loudness more than anything else. The 13.5mm drivers do their job of pumping up the bass to impressive levels but when you crank it up a little louder the richness in sound is lacking. Clarity levels are particularly impressive on music where the sound of individual instruments is at the forefront but when there is any hint of a bass, things can begin to feel a little distorted and tinny. The good news is that if you are planning to use them to drown out fellow commuters, the SoundProof noise isolation does an excellent job of blocking out the surrounding noise. At £99 we think it's fair to demand a pair of in-ear headphones that feel like they won't break in a month and sound as premium as the price. The Atomic Floyd PowerJax are built to last and look great but crucially we were a little disappointed by the performance in the sound department. It's good, but not amazing by any standards especially at high volumes, and cheaper alternatives will offer more polished audio. If you're looking for a pair of stylish, durable earphones with a decent bassy sound, the PowerJax + Remote in-ear headphones could well be a wise investment, we they're still a bit pricey for the audio performance that they deliver.